Along with purchasing several flavors of teas and making some finger foods, organize some games to help make your guests feel at ease and keep the conversation rolling. Board games, croquet, cards and badminton are fine ideas for a ladies' tea party, but you can also plan some games they may have never played before. Award simple prizes like mugs, specialty tea packets or chocolates. 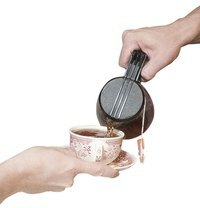 For a healthy dose of competition, ask your guests some trivia questions related to anything involving tea. Diva Girls Parties and Stuff suggests questions like "What famous tea party happened in 1773?" or "Where did chai tea originally come from?" You can even include more personal questions like "How many cups of tea does (friend's name) drink a day?" or "What is (friend's name)'s favorite tea?" Divide the ladies into two teams or allow each guest to compete independently. Instruct them to raise their hand if they know the answer and wait to be called on before shouting the answer. The woman with the most correct answers wins. Select up to 10 cooking and baking recipes from your book and magazine collection. Write each recipe on an index card. To play the Guess the Recipe Game, suggested by Tea Party Guide, read out the list of ingredients on each recipe card, without reading the name of the dish. For each card, your guests should write down what they think the recipe is for. The woman with the most correct guesses wins. The Gateway to Perth suggests this game to help conversations delve deeper. Pour a whole bag of jellybeans into a bowl. The first player must make a statement like "Have you ever eaten a whole bag of chips?" or "Have you ever blushed in front of a man?" The statement she says must be true about herself. If the statement is true for any of the other ladies, then they must take a jellybean. Each woman takes turns making statements. As the game continues, the statements will become more revealing and the ladies will be entertained to see who takes a jellybean. Although this activity is often done by children, you'll be surprised to see how many of your female guests will enjoy themselves. Bake your favorite plain cookies or cupcakes. Provide a range of toppings like sprinkles, gummy candies, chocolate chips, marshmallows and different colors of icing. Instruct your guests to decorate their baked good. Tell them they are being judged. You can award several prizes, such as the most modern design, the most colorful piece and the most densely covered.